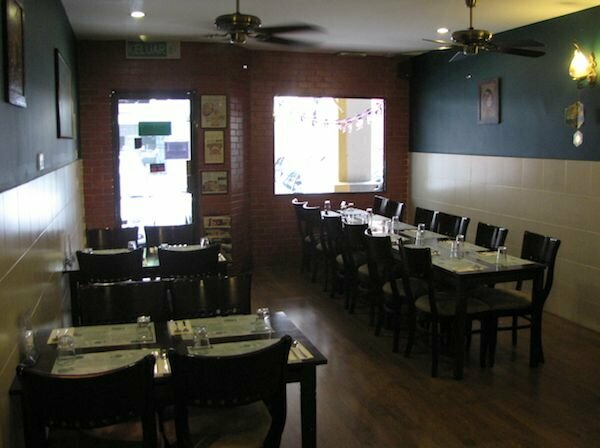 The Village Biryani Cafe is a great Indian restaurant in downtown Johor Bahru. 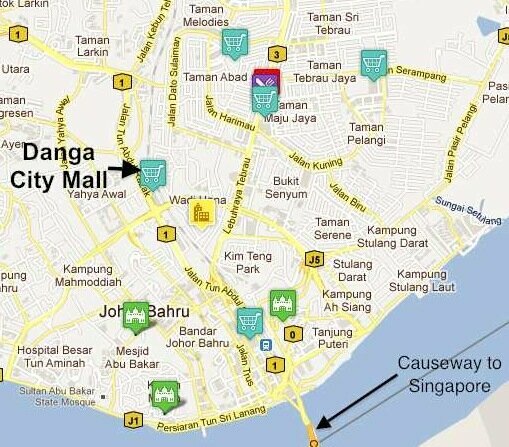 It is 3 blocks north of Danga City Mall. It can’t be seen from the street, you have to go into the complex of shops to find it. And it is well worth it. I have eaten there 3 times and every time the food has been great. 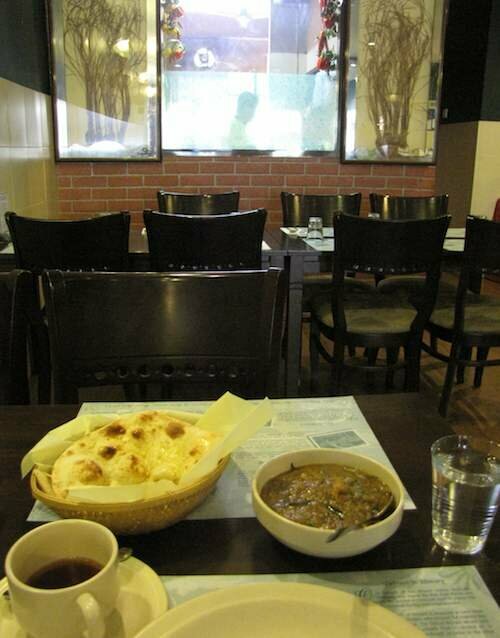 The Indian bread is excellent, and there are a wide variety of choices, prepared in a tandoori oven. The meals have also been excellent every time. Briyani are rice dishes, which the restaurant obviously specializes in given the name. But I love Indian bread so I haven’t even tried a briyani dish yet. My meal at the Village Briyani Cafe in Johor Bahru, with the kitchen in the background. The Village offers Northern Indian food and tandoor specialties. They offer mutton briyani in a different style each week, such as: Hyderabadi, Mysori, Aarcaad, Midnapur and Chetinaadu. The vegetarian selection is great, as usual for Indian restaurants. The service is prompt and pleasant. The inside of the restaurant is very nice and gives you a view into the kitchen. It is air conditioned and very pleasant. Today, Friday, at lunch it was packed, I got the last table. The other times I went at lunch it was not very busy (and the photos are from the first time when I made it just before they closed after lunch). I recommend the Village Briyani Cafe highly. An inside view of the Village Briyani Cafe, looking toward the front door. Address: 15 Susur 1/1 Jalan Tun Abdul Razak, Johor Bahru 80000, Johor. View an interactive version of the map. See our overview of the Straits View Condos. Currently there are numerous condos available in the Straits View condos. One thing you have to keep in mind when looking for a place to live in Johor Bahru is that many available units are not listed online. A few places, like Straits View and Molek Pine have a larger percentage listed online (given that that are targeting expats and also that they are more expensive, real agents representing them are more experienced and have more tools available, etc.). Good places to look for Straits View Condos are iProperty and Propnet. RM 2,500/m – I am guessing low floor with golf course view (but it doesn’t say). Master bedroom: sea view, Balcony: pool view. RM 4,500. Also for sale at RM 680,000. I actually like the design of this type of unit the best (where you have both views, though I think I like the golf and sea view instead of overlooking the pool). I moved to Johor Bahru after taking some time to examine where in Malaysia I wanted to live. You can follow my blog on living in Malaysia. I think the potential for Johor Bahru is great. In my effort to find a place to live I learned a bit about Johor Bahru’s housing options (I was looking mainly at condos). I also found the housing (and living) information that I could find for expats is not as good as I would have found useful. So I will try to have this site fill in some of the gap between what I would have liked and what I found. Here I will provide information on Johor Bahru, Johor state, housing options in Johor, information on finding housing, investing options for real estate in Johor and information about living in Johor Bahru. I will focus on expats as an audience to give the site a focus but hopefully a much wider audience can also find worthwhile information. To some extent “expat” in the Malaysian real estate market is equated with luxury or costly housing. I must say I haven’t seen Johor Bahru housing that is really world class luxury, more it is more just expensive compared to local real estate (but I guess saying luxury means expensive is understood without just saying expensive). I am sure there is some luxury housing (in houses, I would guess – probably out near the 2nd link) but I am skeptical if there are condos, I may find some as I live here. Singapore, sits right to the South of Johor Bahru and many people, expats – and others, live in Johor while working in Singapore. Penang and Kuala Lumpor have much more material online for prospective expats (though really even they could do with much more good content, in my opinion). But I really like Johor Bahru much more, myself. I see the scope of this blog to be focused on real estate but as any real estate agent will tell you people want to know about quality of life options nearby when looking at housing so I will include quite a bit on that also. I think that is critical to making good choices for what housing options are right for you. I think the next 10 years should be very economically dynamic for Johor Bahru (and on a wider scale, Johor state) with significant real estate interest. Great quality of life enhancements are possible and real estate investments have the potential to do very well if the government’s Iskandar initiative can be properly managed. The potential is great and the stage is set very well. The ability to cooperate with Singapore to find mutual beneficial opportunities leads me to believe the potential is as good as nearly anywhere in the world in the next decade or two. But potential can be wasted fairly easily so the future will tell how successfully the potential is realized.